The American goldfinch (Carduelis tristis) is a very common bird across North America and is the state bird of Iowa, New Jersey, and Washington. 2 What do American goldfinches eat? They are generally a small acrobatic finch with coloration that changes seasonally. During the spring, males are a vibrant yellow with shiny black patches just above the beak, lower half of the wings, and along much of the tail. The wings are often dotted with spots creating a wing bar. Their beaks and feet are a bright orange. The females are much more dull, with a more drab olive color all over, but have a distinctive conical bill, short head, long wings, and short notched tail that makes them easier to identify. Males and females are very difficult to tell apart during winter as they take on similar appearances. The males’ bright color comes from carotenoid pigments which are obtained from the foods they eat. Females tend to pick mates with the brightest, most vibrant colors, also possibly meaning they pick the best foragers. Unlike all other finches, the goldfinch molts twice a year, once in late winter and again in late summer. It is this molt in the later winter that brings the bright yellow of the males. The goldfinch subsists on an entirely vegetarian diet, eating only seeds and only consumes insects by accident. This could explain why the goldfinch breeds later than almost all other North American birds, as it seems to wait to nest until late June or July when seeds from plants like milkweed and thistles are at their height of production. They also feed on the seeds of asters, grasses, and trees like alder, birch, western red cedar, and elm. They not only use these plants for their nests but also feed the seeds to their young. Goldfinches tend to gather in large flocks with pine siskins and common redpolls and are common feeder birds. They feed mostly on sunflower seeds and nyjer and will eat straight from the feeder or off of the ground. Native thistles and other heavy seeding plants can also draw goldfinches to residential areas. To keep them safe at feeders though, it is important to consistently rake spilled seeds from the ground to avoid spreading diseases. Goldfinches tend toward habitat in more open areas like fields and floodplains where thistle-like plants are common. They also appear in developed areas like roadsides, orchards, farmland, and backyards. The main habitat they appear to avoid is dense, overgrown forest. Occasionally, the brown-headed cowbird will lay its eggs in goldfinch nests. While the eggs almost always hatch, the newborn birds don’t often survive much past three days due to the all seed diet. Typically males and females work together to find the best nesting site, but the female does all of the actual nest building. Usually, she will build in a shrub or sapling in a very open space, where two or three branches meet. Using spider silk, the female will then create a foundation around these connecting branches. She will take the fluffy pappus from the seeds she feeds on to build out the rest of the soft foundation. After the foundation is built, she will create a cup of soft rootlets and plant fiber woven together so tightly that it can hold water. The entire process takes about six days. When finished the nests are roughly three inches across and two to 4.5 inches high. In one brood, the pair will have about two to seven eggs. The eggs are incubated for 12 to 14 days in which time the babies hatch helpless and naked. Nesting lasts another 11 to 17 days before the birds leave the nest. Usually, the pair will only have time for one brood, but if a second does happen, the female often abandons her mate to finish raising the first brood while she finds another mate and gets started on the second. 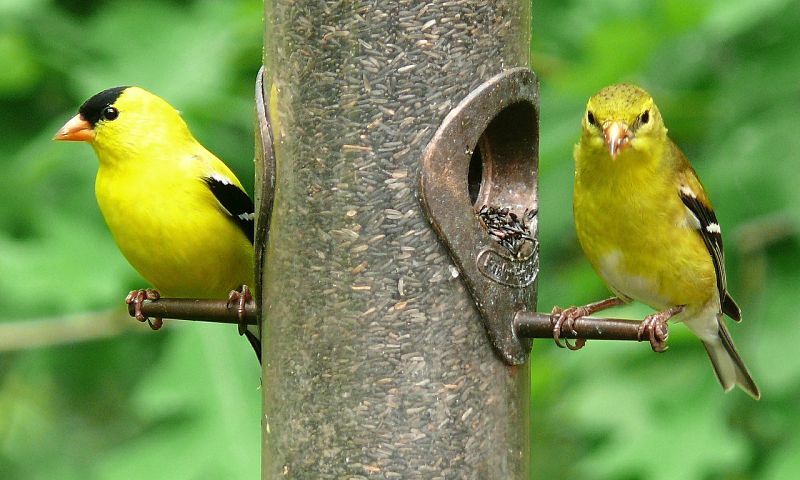 Unlike many other songbirds, goldfinches will not mob predators and tend to let out quiet warning calls from afar. Many northern populations of goldfinches do migrate and tend to find places where January temperatures do not dip below zero degrees Fahrenheit. Although considered numerous in population, the goldfinch underwent a small decline from 1966 to 2014 due to their incredible susceptibility to mycoplasmal conjunctivitis, which also killed many house finches but has yet to show much effect on other birds. Currently, the American goldfinch is considered of least concern with a breeding population of 42 million. Roughly 91 percent spend some of the year in the U.S. while 33 percent spend some of the year in Canada and six percent spend some of it in Mexico. The oldest goldfinch was at least 10 years and nine months old, captured and re-released at a Maryland banding operation. Hey Buddy!, I found this information for you: "The American Goldfinch". 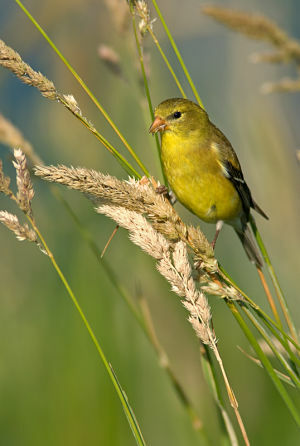 Here is the website link: http://backyardbirdingblog.com/american-goldfinch/. Thank you.